clay and limestone: Doctor, Doctor, Give Me The News! I've had two visits with doctors recently. 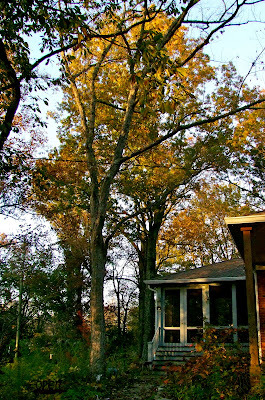 Last month, the tree doctor made a house call to see a white oak that suddenly dropped 2/3rds of its leaves over night~~It seemed strange to drop so many leaves. My neighbor has lost several oak trees to some kind of fungal disease and we wanted to make sure this oak was healthy. Not the possibly sick oak! Knock on wood that this tree is fine! 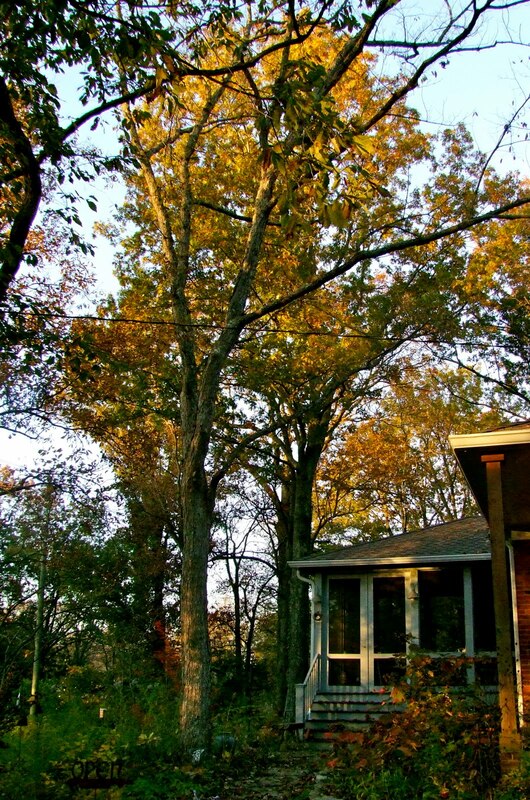 Not only would taking a tall oak down mean a sudden change in the garden...it would be very expensive to do. It's situated right next to the front porch steps off the flagstone path. You can see its denuded branches in comparison to the shag bark hickory and oaks that are lit by the setting sun. It's one thing to make a decision to create a sunny garden and remove trees. It's altogether different when the change is forced. He reassured me that what we were doing~~ Not planting a monoculture of grasses and letting most of the fallen leaves mulch the trees and beds ~~ was the very best garden practice for overall tree health. He shared that he is usually called to a home to see very sick trees in the middle of over fertilized lawns. He and Aaron, the arborist he works with, spend a good deal of their time educating homeowners about maintaining tree health. We walked around the yard and he gave me the thumbs up on all the trees. Noting that there were a few limbs that needed to be thinned in trees in the wayback backyard. It was late enough in the season that it was hard to see how denuded the tree looked. Most of the trees were similarly denuded by the time he was able to visit. He didn't find any evidence of oozing wounds that might indicate some fungal diseases. He asked if we had done any recent digging around the base of the tree. That's when I told him we removed a concrete walkway and added the flagstones~~ It's possible that the root disturbance and the 2007 drought had combined to stress the tree. He suggested a conservative plan~~ watch the oak to see what the spring would bring. The bad news is that it could be dying. But, the good news is that we don't have to take it down immediately. Yesterday, I saw my orthopedic surgeon about my very sore hand. Several months ago I was diagnosed with de Quervain's Tenosynovitis and was treated with an injection of cortisone. It worked beautifully, but, eventually the pain came back. I have decided to have surgery. It seems to make sense based upon how quickly the cortisone wore off! So on December 3, I will arrive at the surgery center hungry, caffeine deprived, cranky from 5 days off ibuprofin, where I will wait for several hours for a ten minute procedure to release the roof of the tunnel that surrounds the tendons. Believe me it is going to be worth it! Thanks for listening~~You are the best! Hope that your oak comes through for you, it is a beauty! You have reminded me that I need to schedule a visit with the tree doctor, we have several old trees on our property that could use a checkup. Your witch hazel is lovely, I just love them. I am looking forward to adding this to my garden, once I can make up my mind on where to put it. :) Good luck with your surgery! Gail, I love your titles. They are always so witty. That's one of the hardest parts of writing a post for me and I leave it to the last. Good idea to seek out a professional where trees are concerned. 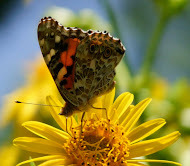 They are such a valuable resource in our gardens. Hopefully your tree will be alright for a long time yet. I konw the surgery will do wonders and I am hoping for a quick recovery for you. It's no fun to be in pain and not able to do what you love- in this case, I am talking about blogging of course. :) Take care! We will say a pray for you. Gail, I hope you tree recovers (and your hand), it is very hard to lose such a large tree. It makes such a difference in the scale of the whole garden(not to mention the sun factor). Lisa, Witch Hazels are the easiest little trees. I chose a multi-stemmed look but they do come as small trees. Frances, I thought you got the cyclamen? It is a terrific little bulb and has never failed to bloom. The fact that I am looking forward to the surgery ought to indicate how much I will miss the ibu! Beckie, Hello! Yes, this wrist is interfering with my fun. Deborah, I like that tree~~and don't want to use my garden budget on taking it down. Now I do have an elm that I wouldn't mind removing to let the sun shine on the Susans' Bed! I am absolutely drooling over the new flagstone path. It is gorgeous. So inviting. I would be delighted to walk there. I hope your tree is just pouting from the drought and root disturbance. Time will tell I guess. I hope your surgery is successful. It is a wearing to have to deal with chronic pain. Best of luck. My goodness Gail girl ! First .. I am glad you don't have to do anything with your oak right now .. that must be a relief. BUT oh my !! .. 5 days off pain relief plus the no coffee part the day of the surgery .. well what can I say but how much I sympathize with what you have to go through .. it will be stressful let alone painful BUT .. the outcome will mean the best of all situations right ? You will be a trooper through it all .. I just know that girl ! Joy, I think It will be a relief and won't that first cup of coffee me marvelous! Of course...the gift in all this is that Mr I will have to decorate the house for the holiday! Gail, we have a very large diseased Oak that is on it's way out. My husband just commented last evening that when the funds 'appear' the tree will be helped to it's end, to prolong it's misery and ours seems heartless. I just had my second cortisone injection in my right elbow one week ago today. Guess what? The pain from the injection finally wore off, BUT now it feels very similar to how it did before the injection. sigh...I have a re-check at the end of December. I'm just glad that the gardening season is slowing down a little around here. Very helpful info about the tree. I hope it bounces back for you. Do heal and mend your hand. Good luck at the doctors. Hi, Gail. My fingers are crossed for your beautiful oak!! My DH says he sympathizes with you, and his thumb still hurts, after two years. There were times he couldn't bend his thumb at or, or it would make an awful popping. Anyway, we commiserate and hope you feel better after 12/3! Wow, well, good luck with your surgery. I had cortisone shots in my hand, man that hurt! I do like the flagstone pathway, it looks like a great addition to your landscape. The years of drought take a while to show up on more mature plant material. I agree with Frances-- get more cyclamen. Good luck with the surgery! I really hope your hand feels better. It would be awful to continue having pain with all the gardening and blogging you do! Healing vibes for tree and hand! I'm having a bit of path envy - it is truly lovely. Perhaps your tree just needs time to recoup without the burden of its leaves. Beautiful walkway, and I bet the tree will do nicely too, and just so you won't worry, I'll hold your cup of coffee for you. Best of luck on the surgery Gail, and we know you'll do great! I have been putting off calling my doctor to schedule the same surgery. I had the shot during the summer and the pain is back. I don't blog but I write articles from home - it's hard to do with one hand hurting. As for gardening, I have just been making lists and hoping I would have a good day soon. Good luck with your surgery. Hi Gail, Love your witch hazels and glad the oak may not be a goner. And I'll be thinking of you 12/3--you know, I have de Quervain's, too, in my left thumb. Or I should say, HAD! I got it when gardening professionally and, yeah, it REALLY hurt. I just worse a brace at night and it has righted itself over several years. I'm very glad it did, because I didn't realize it could get as severe as yours. I know it's the sheath around the tendon, not the tendon itself, in de Quervains, but what does "raising the roof" mean? They somehow create some wiggly room in the sheath so it's not as tight??? Best of luck with the oak. I hope it survives! That probably has a great presence in your garden you would sorely miss. I hope your surgery goes smoothly. Dear Gail, as everyone else has said, all fingers and toes are crossed here for successful surgery on the 3rd! There is nothing quite as relieving as the absence of pain after long enduring. Bless you and keep you!!! I'm sorry to hear that you have to have surgery, but I hope it brings you relief from the pain you've been experiencing. Your flagstone path is lovely! Good luck with your surgery AND with your beautiful oak. Here's hoping it makes a complete recovery in the spring. I adore that flagstone path! And it is so well suited to your property. I hope the surgery does the trick for you. It's all that repetitive motion that does it. I hope your Oak will be ok. It would be a shame to lose it. Wishing you a speedy recovery when you go for the operation, and a fast track back to blogging with 2 hands. I'm glad your tree has an optimistic outlook - what a treat to have so many old trees in your yard. Best wishes for your surgery, Gail. I'm glad it's your hand and not your heart, but it's still a trial. Good thing you won't be tempted to be out gardening as much when you're supposed to be resting the recovering hand, since it's so late in the season, right? I can't tell you how many times people have brought me sick leaves to look at from their trees. I ask all the same questions as your first Doctor and it usually ends up that they or one of their neighbors has applied herbicide on the lawn near the tree. The chemicals don't know the difference between a weed and a prized tree. As to your hand issue, best of luck. At least it is coming at a good time of year for a gardener if there is a lengthy recovery, which I hope there will not be. It reminds me of my Dad who told his new replacement Dr. that it had to be done between deer season and flounder season or he would not get it done . Gail, I do hope your oak does well. I see how the Shag Bark has that golden glow with the sun shining on it. Beautiful. Love that walk. Looks much better than concrete. Do take that much needed care of yourself. I do understand how you feel. Hoping for a speedy recovery & hoping you will be free of any pain. Gail, I do hope your oak will survive! I think you were lucky to find such an excellent doctor and to hear his reassurances. Good luck with your surgery--isn't that typical to have to wait hours and hours for a short procedure? And I know for me the caffeine deprivation is the worst part:) I'm not familiar with this syndrome, but I know a few people who've had surgery for carpal tunnel syndrome and were so happy they had it done. Good timing, too--you should be all set to go for gardening in the spring! Hoping those few days without Advil won't be too bad. So glad to hear that your trees were not affected by the fungus. Sorry to hear you need surgery. I'll be thinking about you as the date gets closer. I'm hoping for the best for both you and your oak tree. I'm not sure I would be as brave as you to have surgery but I know the relief will be worth it to you. I do love your flagstone path. Have you shown us that before? Somehow I've missed it and looks so right for your garden. You must have felt proud at what the tree doc said! Oh Gail, I know the surgery will make your hand feel better but I hope it won't keep the blog writing down too long. And I know how you feel about your oak. It's probably just a little stressed. Big hugs and we love ya. Oh dear, good luck with 'doctoring' all the limbs, dear Gail. Glad you are waiting for spring for the stressed oak but from all your past pain, rushing for your surgery is smart! You will be fine by spring and, hopefully, so will your beautiful oak. I love the flagstone path. I pray your operation goes well and you are soon pain free. Your Witch Hazel and Hickory have such beautiful golden color. I hope your oak can recover from the drought and disturbance -- your tree doctor sounds like he knows what he's doing! I'm glad to hear that you will soon get relief for your hand. Tendonitis is very painful. Gail, I hope your surgery goes swiftly, smoothly and successfully. And may your oak live a long and healthy life. With that pathway at its feet, it has a lot to live for! I do hope the surgery goes well! I'm afraid human hands weren't really designed for tapping on keys and mousing. My hands always remind me when I've spent too much time doing page layout or messing with photos. 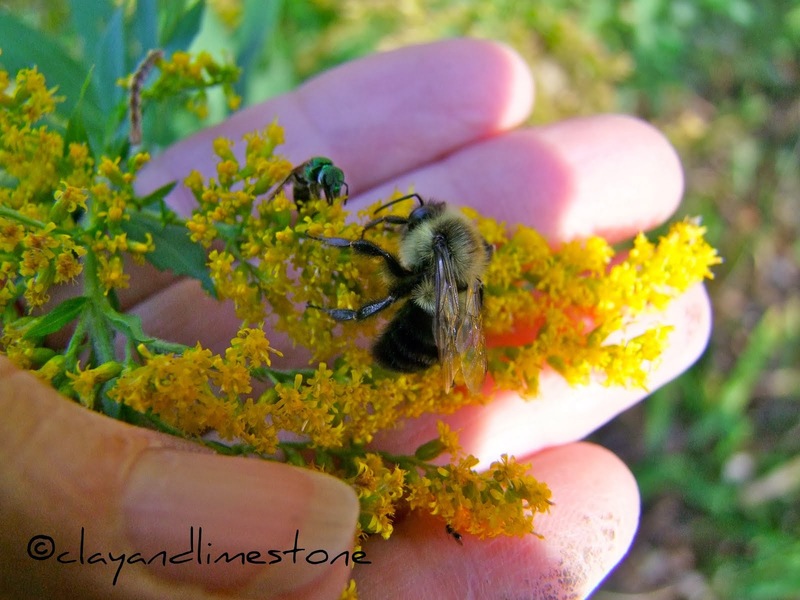 Much more fun to be in the garden, but it is wonderfully nice to be able to connect with fellow gardeners in the blogging world, too! Gail, good luck to both of you! I think it will be a marvelous spring for both you and the oak tree. Heal well, and fast! Gail, best of luck on your surgery. Let's hope your oak is the best of health next spring. I love your flagstone path. Gail, I'm so sorry to hear that your pain is leading actual surgery. We will miss your blogging for sure. Your entries are always so thoughtful and interesting. Wishing you all the best. Good for you for taking the bull by the horns and getting your hand fixed Gail! And congrats on your healthy tree. Gail, I feel your pain. I've been lucky so far and haven't needed surgery. When the wrists flare up rest and breaking out the braces usually calms things down within a couple of days. Sounds like yours is much more troublesome. I wish a full, speedy, uncomplicated recovery for both you and the oak.